Varttina: Music from Another World Varttina features three female singers, six male acoustic musicians and lyrics rooted in ancient poems from Finland's Karelia region. Mari Kaasinen and Janne Lappalainen tell Liane Hansen about their music and their tenth CD, Miero. 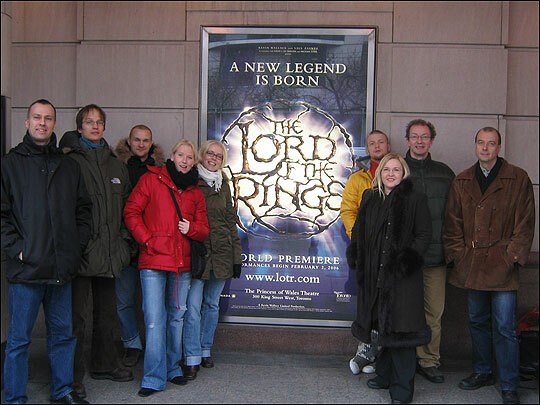 The whole group poses outside The Princess of Wales Theatre in Toronto. J.R.R. Tolkien's Lord of the Rings is back in the spotlight. A musical version of the famous saga is now on stage in Toronto. The score was co-composed by Bollywood's A.R. 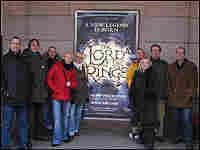 Rahman and the Finnish musical group Varttina. Varttina's three female singers and six male acoustic musicians have been together for more than 20 years. The group recently released their 10th recording, called Miero. Their lyrics are rooted in ancient poems from the Karelia region of Finland. Their vocals draw from the region's traditions of women's voices. And their music incorporates some exotic instruments, including the bouzouki, nyckelharpa and guitalele. The result sounds like mysterious incantations from an ancient tribe. Mari Kaasinen and musician Janne Lappalainen tell Liane Hansen about the folk traditions associated with Varttina's music and why the group emphasizes female vocalists.